A holiday of luxurious tranquillity awaits when you holiday at Tassel Berry Lodge. 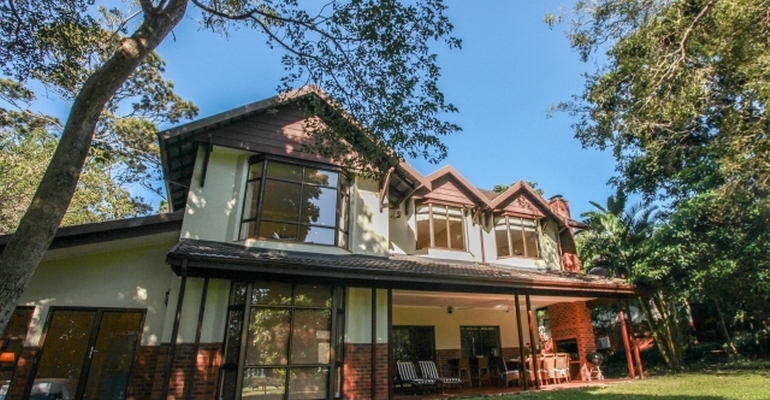 Situated in Selborne Park Golf Estate, this magnificent 4 bedroom, 3 bathroom Villa can accommodate up to 8 guests. A furnished undercover veranda with built-in braai area offers spectacular views. A spacious open-plan lounge opens out to the garden through glass doors allowing for ample sunlight to enter the home. The dining area has an 8 seater dinning table situated adjacent to the fully equipped kitchen for easy catering and leads out to the undercover veranda. Spacious bedrooms have double or twin beds respectively, are furnished with built-in cupboards, bedside tables, lamps, chairs, dressers, and all enjoy views of the surrounding garden. The three bathrooms - 2 en-suite and 1 sharing - each have both a bath & shower. Guests staying at Pettigrew’s Place are invited to make use of the fabulous facilities at Selborne Park Golf Estate. Aside from the immaculate 18-hole golf course there is also a swimming pool, tennis courts, children’s play area and a restaurant & bar where delicious meals can be enjoyed daily.